Here'a s list of Global Version characters under the Neutral Element, in the action RPG mobile game: Sword Art Online: Memory Defrag. Available for Android and iOS gamers. Refer here to check the base stats, battle skills, skill slots, and other info of your favorite characters. *Combo Partner [Neutral Element] - Increases damage attained by 10%. *Combo Partner [Neutral Element] - Increases damage attained by 10%. [Assist] - HP+. *Combo Partner [Neutral Element] - Increases damage by 5% vs Neutral Element. (5-Stars Only). *Combo Partner [Neutral] - Increases damage attained by 10%. 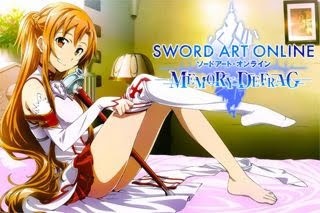 *Combo Partner [Asuna] - Increases damage attained by 10%. *Combo Partner [Kirito] - Increases damage attained by 10%. *Combo Partner [Guns] - Increases damage attained by 10%. *Combo Partner [Swords] - Increases damage attained by 10%. *Combo Partner [Rifles] - Increases damage attained by 10%. *Limited Event A free character from a limited event. Pretty much average overall, mostly used for floor clearing as support healer. *Fatal Bullet DPS ratings are really good paired with great combo gen speed. An excellent unit overall for both floor clearing and ranking events. First batch of rifle characters with element advantage. *Combo Partner [Leafa] - Increases damage attained by 10%. *Fatal Bullet Excellent DPS ratings paired with great combo gen speed. Also an excellent unit overall for both floor clearing and ranking events. First batch of rifle characters with element advantage. *Combo Partner [Lisbeth] - Increases damage attained by 10%. 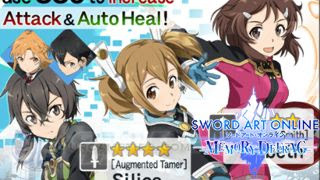 *Combo Partner [Silica] - Increases damage attained by 10%. *Limited Event First free character that can wield automatic rifles. Above average DPS and combo gen speed, a decent unit overall. Use SS3s in-line with targets to avoid misses. *Combo Partner [Automatic Rifle] - Increases damage attained by 10%. *GGO Leaning on You SS3's DPS are exceptionally high and easy to spam, making him a great combi partner for ranking events. Survivability is just average so learn his regeneration skill slot for some boost. *GGO Leaning on You SS3's DPS are exceptionally high and easy to spam, making him a great combi partner for ranking events. Survivability is below average so learn his regeneration skill slot for some boost. *Ticket Scout DPS ratings are really good, turn-off auto-approach to control her SS3s if needed. Has an excellent survivability too especially when upgraded to 5 Stars. *Fateful Showdown An excellent unit for ranking events and floor clearing (especially vs bosses). Finally, a shieldblade unit that has great survivability paired with a very nice DPS and 100% crit rate SS! *The Two Phantom Bullets An excellent unit for ranking events because of his Crit SS that ensures crit damage when using skills. SS3's DPS are exceptionally high too paired with decent combo gen speed. Overall, a recommended unit even if he doesn't have a healing effect. *Combo Partner [Sinon] - Increases damage attained by 10%. *Limited Event Burst DPS and combo generation are just around average, survivability is a bit lacking but still a decent free character for new players. *Combo Partner [Neutral] - Increases damage by 5% vs Neutral Element (5-Stars Only). *The Two Phantom Bullets An excellent unit for ranking events because of her Crit SS that ensures crit damage when using skills. SS3's DPS are exceptionally high too paired with decent combo gen speed. Overall, a recommended unit even if she doesn't have a healing effect. *1st Anniversary #3 SS3's DPS are exceptionally high despite having low combo gen, thanks to his very low skill animation, suitable as a support nuker. Survivability rating is above average but his high damage output can help end battles much quicker. *Combo Partner [Male] - Increases damage attained by 10%. *1st Anniversary #3 SS3's DPS are exceptionally high despite having low combo gen, suitable as a support nuker. Survivability rating is above average but his high damage output can help end battles much quicker. *1st Anniversary #2 SS3's DPS are exceptionally high and easy to spam, making her a great combo partner for ranking events. Survivability is above average so learn her regeneration skill slot for some boost. *1st Anniversary #2 SS3's DPS are exceptionally high, paired with nice combo gen speed, making her a powerhouse unit for ranking events. Survivability is pretty decent so learn her regeneration skill slot for some boost. *Limited Event A free character from a limited event. Overall performance is average of below, but can still be used with a 5* Eugeo as combo partner and to increase DPS. *Combo Partner [Eugeo] - Increases damage attained by 10%. *1st Anniversary #1 SS3's DPS are exceptionally high, paired with nice combo gen speed, making him a powerhouse unit for ranking events. Survivability is pretty decent so learn her regeneration skill slot for some boost. *1st Anniversary #1 SS3's DPS and Damage Output are exceptionally high, paired with nice combo gen speed, making him a powerhouse unit for ranking events. Survivability is pretty decent so learn his regeneration skill slot for some boost. *Ticket Scout SS3s are pretty much on point but deals very high damage output and DPS, paired with decent combo generation. Limit Break to unlock more Skill Slots like her barrier effect, to compensate her low survivability. *Limited Event SS3s are pretty much on point but ends behind target, making it easier to spam. Damage output, DPS, and combo generation are pretty low though. *Sword Dance SS3s can be spammed from a ranged position just watch out for incoming attacks. Turn off auto-approach to increase range and turn her in to an auto-aim caster. Great unit vs Neutral element enemies. *Cosplay Workers SS3s have high DPS rate and combo generation, with decent range that ends behind target making it easier to spam. Use from the start to inflict a quick Atk&Def Down Debuff. *Cosplay Workers SS3s have high DPS rate and combo generation. Use from the start to inflict a quick Atk&Def Down Debuff, best used after parrying or while target is stunned. *Cosplay Workers SS3s have high DPS rate and nice combo generation. Use from the start to inflict a quick Atk&Def Down Debuff, easy to spam but watch out for incoming attacks. Base attack is high but critical rate is low. *Cosplay Workers A caster than can parry with lance, with high DPS rate and combo generating SS3s. Use from the start to inflict a quick Atk&Def Down Debuff, SS3s are easy to spam just time it well. *Cosplay Workers Her SS3s have high DPS rate and nice combo generation. Use from the start to inflict a quick Atk&Def Down Debuff. Damage output is a bit lower than others, but her SS3s are wide and easy to spam just time it well. *Cosplay Workers Her SS3s have high DPS rate and nice combo generation. Use from the start to inflict a quick Atk&Def Down Debuff, SS3s are possible to spam but needs crucial timing. Critical rate is low, so it might be best to use after parry, or rely on RNG. *Ordinal Scale v2 Also has a high DPS and combo generation making her an excellent Neutral element nuker, but her SS3 is a bit hard to spam, requiring you to parry or use while the enemy is stunned. *Ordinal Scale v2 SS3 can be spammed from a ranged position, but watch out for auto-aim or dashing attacks. Decent mob clearer, but combo generation is pretty low. No survival skills too so better use with healer for floor clearing. Nice support nuker unit vs Neutral element. *Ordinal Scale v2 SS3 connects well, and ends on the opposite side of target, useful for spamming SS3s. Great unit vs Neutral element enemies. Has low combo generation but with very high DPS rate, so she is best used as a support nuker. *Sword Dance SS3 connects well, and ends on the opposite side of target, useful for spamming SS3s. Great unit vs Neutral element enemies. *Sword Dance An upgraded version of Lisbeth [Mace Master]. SS3 packs some decent damages but still avoid directly top/bottom of your target to minimize misses. Got some nice HP and Defense stats but doesn't have any survivability skills to back them up. *Idol Series Barriers could be helpful for spamming SS3s with ease. Best used after parrying for better crit rates. Parry+Switch is still viable if you can do quick attack cancel to parry, so you won't lose combos. *Sword Dance Upgraded version of Asuna [Lightning Flash], SS3 has lower MP req with nice burst damage, but avoid using if directly above/below the target (-60% dmg output). *Sword Dance An upgraded version of Kirito [Black Swordsman], SS3 has lower MP requirement and attack animation. Dual Wielders will get Max/Min speed depending on combos (10~50) but will only consider their average speed and DPS. *Ordinal Scale SS3 is similar to Yuuki [Zekken] (Sword/Slash type not Rapier/Thrust), but with nice attack buff and heal. DPS is also notably high that can be increased further due to her high crit rates and combo bonuses. *Ordinal Scale High attack stat combined with his SS3 and combo bonuses will definitely unleash devastating damages! Attack animation is kinda long though so burst damage is a bit lower. *Ordinal Scale Great tank unit with high HP and Defense stats. Combo generation is a bit shaky but her SS3 can still deal A LOT of damage. Best used after parrying, or for parry switch tactics. *Ordinal Scale Her SS3 is full of high burst damages that can be increased with combo bonuses for more DPS. Position and time it well to home in all Pina's attacks. She has low defense output, so dodge attacks that can't be parried. *Ordinal Scale SS3s has high burst damages with nice buffs, while her SS1 also has a notable DPS and can abuse all combo damage bonuses (multiplayer). Great support nuker or as a finisher (turn off auto-approach to increase range). *Limited Event SS3 is pretty good for clearing out enemy mobs. Defense buff is also a nice touch with extra 30 MP to all including Yuna (also use between fights, while the timer is paused). *Start Dash A nice sturdy character, but lacks fire power as the battle goes due to slow MP gain. Ideal for tanking (handles agro) and as a finisher to get the most out of his SS3. *Combo Partner [Neutral Element] - Increases damage by 5% vs Neutral Element (5-Stars Only). *Start Dash Focus more on her offense, and rely on your parry and dodging skills for survivability. Attack animation is still kinda long, despite having a Speed+ buff. *Start Dash High Attack stat for a melee, but low HP and DEF. Dual Wielders will get Max/Min speed depending on combos (10~50) but will only consider their average speed and DPS. *Start Dash Stats are actually pretty good, and with nice damage output. SS3+ will make him shine even more because of his short attack animation, best used as one of your burst damagers! *Start Dash A nice sturdy character, but lacks fire power as the battle goes due to slow MP gain. Ideal for tanking (handles agro) and as a finisher to get the most out of her SS3. *Start Dash Philia is a nice support unit that can debuff bosses at the start of battle to lower down their defense stats. SS3+ can also deal some decent burst damages because of it's very short attack animation. *Start Dash Great DPS and survivability. After using SS3, use SS1 to defeat enemies. Lacks a combo generator skill, so mix in some regular attacks and rely on crits. *Start Dash A decent alternative if you need a gun wielder. SS3+ will upgrade her gun's firepower and turn her bullets into homing bullets. (turn off auto-approach to increase range). *Start Dash Notable wide range damage output packed with a nice take down effect from her SS3! (some higher tier bosses can't be taken down though). SS3 lacks combo generator, but still decent for boss fights. *Limited Event OK as filler for your team if you don't have any alternative. She has the lowest overall stats among all melee 4* characters, and her SS3 misses a lot too against a moving target. How To Obtain Specific 6*~4* Characters? - Limited Events: Free characters via limited events.